Becoming a print historian is like being a time traveller. Here is my Tardis! Updike's two-volume tome of the history of typography, is an excellent primer into our shared history of printing. Authored originally from a series of his lecture talks from 1911-1916, Printing Types published in 1922 was intended as a practical and historic record, to inspire contemporary printers of the early twentieth century (and beyond). Updike's texts are beautifully illustrated with reproductions of celebrated examples of print that bring centuries of printing history alive for the modern scholar. My copy is very special to me. Its value is not in it being a first edition. This is Volume Two of the second edition, and second printing, published in 1951. A personal value for me is in the monogram of its previous owner, Peter Isaac. Peter Isaac established the British Book Trade Index (BBTI), in 1983, at the University of Newcastle. For my PhD study, Birmingham during the long nineteenth century, presents a case study in the development and deployment of the sanserif. The database is an exceptional tool, which records approximately 959 records for printers trading in Warwickshire, with a majority of 779 records in Birmingham. Since 2005, Dr Maureen Bell and Dr John Hinks have maintained the BBTI database, which has recently relocated to the Bodleian Library, in 2015. The BBTI is an excellent tool for Print Historians, for myself it demonstrates the diversity of occupation in Birmingham during my period. Time traveling back to the early twentieth century and to Updike for the final word today, on display types of the nineteenth century, in particular his beautifully measured description of the Fat Faces of Robert Thorne as 'the vilest form of type invented!'. David Osbaldestin is Deputy Course Director of Graphic Communication at Birmingham City University (BCU) and he has taught internationally for 15 years. 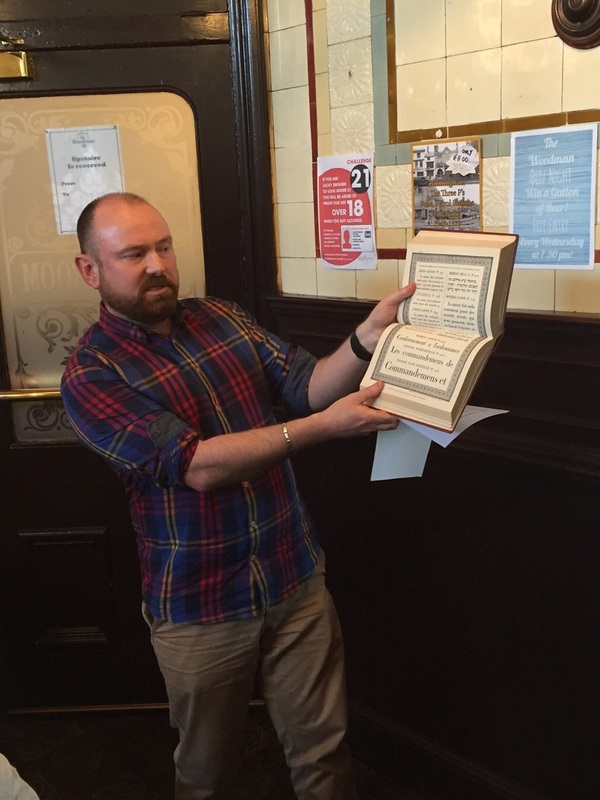 Through his studies at Reading University, he has developed his research in Typographic and Printing History, and is currently a PhD researcher investigating the Sanserif in Britain. A practicing typographer and graphic designer, David manages the BCU live creative agency; a student led design studio and enterprise initiative. He has recently supervised a KTP and KEEN Supervisor facilitating two European research projects in Digital Brand Design funded by the Economic and Social Research Council (ESRC), and the University of Wolverhampton. Recent papers: Birmingham’s nineteenth century printers and the use of the sanserif, The form of the book, Book History Research Network Study Day, BCU, Birmingham, December 2014. Sanserif; the face of profit, purity and power, Landmarks in Printing: from origins to the digital age, The Printing Historic Society, St Brides, London, November 2014. For a Print Historian, narrowing down a lifetime’s love of letters, to one letterform (from one typeface) is a task of Herculean proportions. Typography is one of the fundamental building blocks of graphic communication, literally language made visible across the printed page or screen. Type has the power to unlock distant voices and cultural stories from the past, and when seen as a lens that reflects cultural values, it presents us with new contexts to read the changing world around us. Printing type is a thing of great physical beauty, from its inception through the meticulous craft of hand and eye coordination from the punch cutter (or type designer), to its reproduced form in print and beyond. Each letterform can be viewed for its own individual personality based on its design merits, style and character. The reader holds type precious; the act of reading itself can be private and personal, holding meaning and value within a communication system, and good typography continues to inspire new generations every day. Browsing through the pages of the 1839 Specimen of Printing Types by Blake and Stephenson is a sublime act of typographic pleasure. The specimen book is a cabinet of textual curiosity. Reflecting the sporting events popular during the period, matching bare knuckle fighting to reading, a stage is set for a new spectacle in typographic entertainment. The radical and dissenting lead characters of the display faces stand proud, introducing their bold personalities and announcing their persuasive services to the world of advertising in the age of empire. The contenders step forward; competing against the voluptuous charms of fat face ‘Eight Lines, No.4’, and the muscular architectural slab serifs of ‘Eight Lines Condensed Antique’, charges a monumental heavy weight sanserif, ‘Ten Lines Sans-Surryphs Ornamented’. An upper case wooden type, weighing in on a metal body of 120 points tall (just shy of four centimetres), this ornamented colossus was intended for use in playbills and other advertising ephemera of the nineteenth century. A brazen condensed face with sculptural proportions, the letter ‘H’ has clout. It is a serious contender, occupying a balanced and majestic stance. As opposed to the primitive styles expressed by its sanserif contemporaries, its ornamented quality (built up through a series of concentric lines) creates the illusion and weight of a three dimensional form. Characteristics that resonate today, in twenty-first century type designs, such as Obsidian by Hoefler & Co. In the nineteenth century, this letter ‘H’ shouted out from walls of printed media competing for attention, through the smog of polluted urban streets, and the visual pollution of mass communication. This explosion of print created a new need in society, a demand for visual systems in which readers of all levels of literacy could differentiate between information that was regarded as newsworthy, as opposed to advertising sales pitches. In fulfilling these needs, ‘Ten Lines Sans-Surryphs Ornamented’ has strength and boldness. Alongside the mixed styles of the display types, it commanded attention from the eye through its physical power within the visual hierarchy of print advertising; and in the process reflecting the values of power, iron and coal from the Industrial Revolution. This is the face of the future, yesterday. The brand consultancy and corporate identity work of Wolff Olins is no stranger to courting controversy and media attention. From the ground breaking communications of its founding directors Michael Wolff and Wally Olins in the 1960s to the challenging positioning of their dynamic identity for the 2012 London Olympics. It is exciting to see that their new typographic identity for the Metropolitan Museum of Art has already attracted stirring critiques from esteemed critics prior to the deployment of the new logo. In repositioning the brand identity for the Met, Wolff Olins are participating in a deeper narrative with the brand and its target audiences. The interest and focus on the typographic led design of the new identity is testament to the impact of graphic communication on the relationships that we have with the brands that we love. Only time will tell on the success of the new brand design, however it has already positioned the museum centre stage in a media discussion about a logo. I've just stumbled across a summary of my talk from the Gothic Convention last May. It's interesting so see how my paper has been interpreted. The event was extremely fun and a pleasure to present. There are some great podcasts on the site, unfortunately they've linked to the wrong clip for me! "David began his talk by defining the difference between Gothic typeface (script implemented in the Guttenberg Bible and characterised by exaggerated cursive stroke and black letter) and Sanserif, an unassuming typeface (compared to the flamboyant strokes of the Gothic) influenced by early British grotesque printing types. Ironically, despite the influence of Gothic typefaces in many parts of the world, Sanserif script was most often used in book typography, and thus usurped Gothic typefaces to become the de-facto font of choice for Gothic pieces. Despite this wide use of Sanserif script, twentieth-century typographic classification and the utilisation of traditional Gothic typefaces on the front covers of books reinforced the general misconception of Gothic typefaces. The Sanserif typeface also gained popularity in the world of advertising, and by the mid-nineteenth century, new Sanserif typefaces were being created, and were widely used by jobbing printers. Given its affinity with the values of certain movements, such as Industrialism and Romanticism, the Gothic Sanserif typography acts, as David so concisely puts it, as a ‘moral compass’, which is ‘simple, bold and uncomplicated.’ I, personally, found the talk rather refreshing and untypical of the genre. Often, this display of the Gothic is overlooked (perhaps because contemporary fonts are housed on computer software – technology which is worlds apart from the dungeons and castles of traditional Gothic lore!) and it was interesting to discover the origin and influence of what became one of the most prominent tools of advertising".